Blastocystis and other bowel parasites remain underdiagnosed and under treated despite many studies from non-Asian countries showing that protozoan parasite infections such as Blastocystis and D fragilis can lead to development of functional bowel disease, including Irritable Bowel Syndrome (IBS). In a study from Norway, structured interview and questionnaires given 12–30 months after the onset of acute protozoan parasite infection revealed that 81% patients with Giardia, 50% of patients with E histolytica and 46% of patients with Blastocystis had symptoms of chronic IBS according to Rome II criteria. Chronic Blastocystis infections have been found to be unresponsive to conventional antibiotics like metronidazole and tinidazole, and, as yet there has been no real consensus on treatment. The many asymptomatic carriers, the lack of understanding of Blastocytis’s complexities, life cycle and immune resistance to common treatments, have all contributed to controversy and delays in conclusive research findings. There is no FDA approved treatment for Blastocystis ‘hominis’ infection. Physicians have reported success in some patients with several prescription drugs, but the success rates for treatment of Blastocystis ‘hominis’ are much lower than for other diseases. Many patients remain symptomatic after treatment. Despite this, Blastocystis infection is commonly treated in all countries by many physicians. However, medical culture varies, and in some parts of the world it can be frustrating and difficult to find a physician to treat the infection. 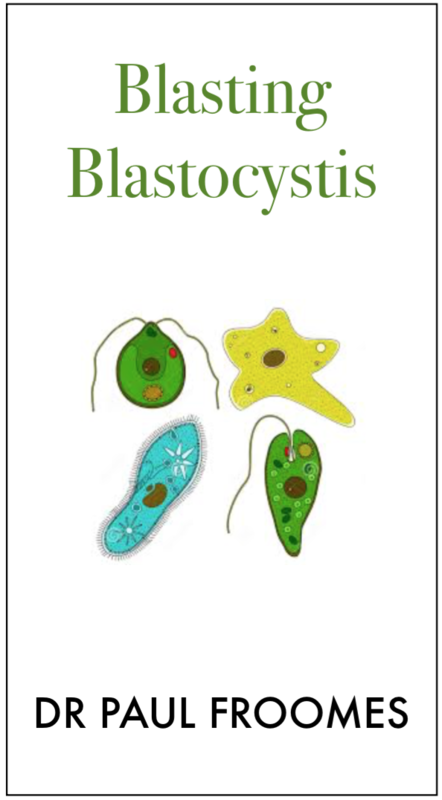 Get Treated - Dr Froomes has years of experience treating difficult and resistant cases of blastocystis infection, and with this book he guides you through all the different options available. Dr Froomes is well versed in all the current medical treatments for Blastocystis and can assist you in getting on with treatment from the very first consultation.